Promenez-vous sur le Skybridge qui relie les tours jumelles Petronas et observez les rues de la ville de Kuala Lumpur d'en haut grâce à votre entrée à la terrasse panoramique des tours. Le fait de réserver la visite des tours jumelles Petronas à l'avance vous fera éviter le souci des longues files d'attente pour l'achat de billets et vous fera gagner du temps. Il suffit de choisir le temps que vous voulez visiter, présenter votre bon d'échange électronique à votre arrivée, puis de monter à la terrasse panoramique dans un ascenseur à grande vitesse. This worked great for us. Perfect, stress free way to see the towers. 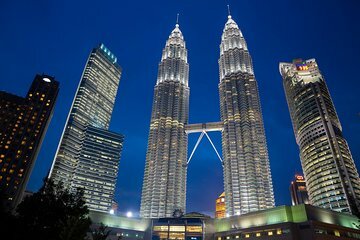 We would highly recommend Viator's Petronas Twin Towers Admission Ticket option. A great experience and a must do when you go to this city. Suggest that, as we did, you book your tickets and time slot before you go to ensure that you get up. As you would expect, stunning views from the top. I felt the prices were a bit on the higher side (58 USD) compared to what te package has to offer. It only included visit to 2 floors and I beleive that is not enough. Maybe you can do some innovation and offer something more for that money . The operator in Kuala Lampur was really professional.He wait for us in the main entrance.Many thanks. If I am honest, I would recommend going to Marini's on 57 for cocktails and a great view than go up the Petronas Towers as you get 2 experiences for one! However, the views from the Petronas is good too, 360 degrees at the higher tower floor. Overall the experience at the Petronas is well managed. Hazzle free visit. E take s supplied were a treat. A must do if visiting Kuala Lumpar spectacular views from the tower. Choose the sunset visiting time which was well worth it. One of the must go places in Kuala Lumpur. Fastest elevator every ridden. Over 80 floors in about one minute. You can hear air going out of your ears. Amazing is the bridge connected two towers are not fixed. Towers can swing while the bridge sliding between them. Make sure to get there on clear day. The Petronas Towers Experience itself is amazing and highly recommended. Be prepared to pay extra for souvenir photos and other souvenirs. However, I strongly recommend booking directly through Petronas Towers and not through Viator - their supplier is incredibly poor quality. We purchased this deal because we thought we were getting e-tickets. We then read after booking that our tickets should be collected from Counter 3 at Petronas Towers. Not being Malaysian, our mobile phones weren't able to be used in Malaysia due to issues with our local telco. So we rocked up to Counter 3 at Petronas Towers to collect our tickets only to be told someone else had them. One of the staff at Petronas Towers rang the booking company for us who sent someone over to us. Turns out he had run for 40 minutes to get our tickets for us. He arrived five minutes before our scheduled start time ... which it turns out was 7.30pm, not 7.15pm as our paperwork said it was. Overall, this was a highly stressful situation for all involved - hence save your own time in future and book directly through Petronas Towers!